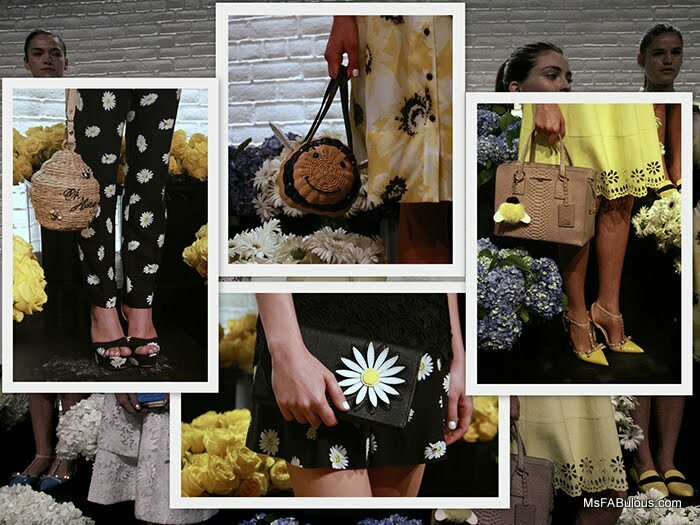 A spring collection from Kate Spade is like visiting the most fabulous garden party ever. This season, the blooms were more urban. The venue was filled with buckets upon buckets of fresh flowers to emulate the surprisingly plentiful selection offered by NYC'S modest bodegas. There were several groupings of inspiration. There was a floral and sweet group of pink, red and black with bigger shopper handbags, feminine shoes with bows or rhinestones. The more whimsical offerings included puppies shaped bags, circus carousels and teapots. There was a honeybee group with more of a yellow, white and black story. Daisy motifs were in appliques, prints and laser cut patterns on the clothing. Handbags included a demure daisy clutch to wicker honeypots. Kate Spade remains a favorite among women in NYC as one of the few brands take us away from our cliche black. This brand does sweet and feminine but with a twist, (just like our cocktails).